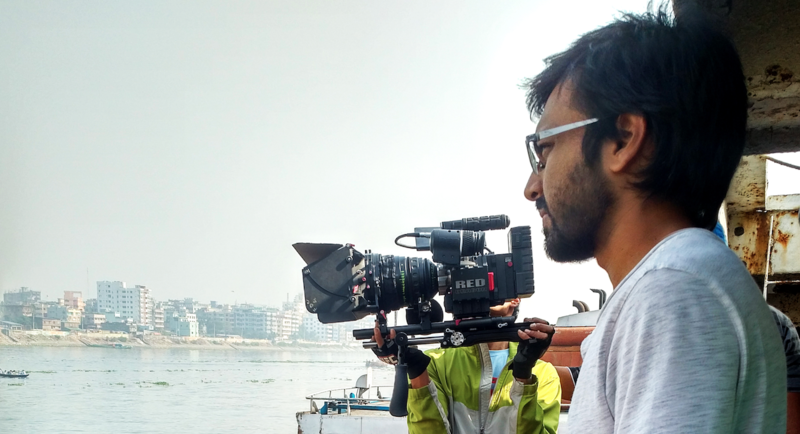 Ashraf is passionate in sharing this Bangladeshi production with a larger audience, he states “OMMI is an important film because this is the first major attempt to really bridge the local industry with the rest of the world”. From sharing his time in both Bangladesh and the USA, Ashraf has a global sensibility that he brings to his work. OMMI has a producing team in both the UK and Bangladesh, so it has an inflection from both a Western and Bangla perspective. Ashraf describes the international appeal of the film, “we are making global film, and an international standard that Bangladeshis all over the world can be proud. The heterotopia of sci-fi films from the original cult BLADE RUNNER to GHOST IN THE SHELL (2017) are given a local aesthetic to create a whole new palette”. He further states, “I want to strive hard to create a new and unique audio-visual aesthetic that is meaningful and refreshing. Something unlike anything before seen”. OMMI features an array of science fiction sets and props, including an exo-arm, drones, robots and artificial intelligence. However, at its core the film has a very important message. Ashraf was inspired to create the film based on a real-world campaign, created by Terres Des Hommes, whereby a digital 3D model would entrap child predators online. “I wondered, what if this was taken to the next level with a sentient A.I simulation created in Augmented Reality that would look real, and behave in ways which were indistinguishable from human behaviours”. OMMI also explores the disparity between developing countries and 1st world ways of life. Ashraf explains how the key location, the ship graveyards, are symbolic of the inequality many people face, “The ship graveyards on the edge of Dhaka are both inherently engaging, and sadly appropriate, world settings”. OMMI is the perfect opportunity to present the high quality talent that exists within the Bangladesh film industry. The film is host to a number of artists, set makers, animators, costume designers that are based in Bangladesh. This is something Ashraf feely very passionate about, allowing the world to witness the growing and unique Bangladeshi resources. He states, “I want to take this chance to show the world and establish Bangladesh as a centre of filmmaking. Equally this is the very first sci-fi thriller made in Bangladesh, so I want to show people here that we can create genre films for this young country’s large and underserved student population”. This is surely going to be an exciting endeavour you certainly won’t want to miss. Stay up to date with this project & Amit’s progress by following us on Facebook @OMMIMOVIE and on Twitter and Instagram too.